Prime Minister Theresa May spoke to DFID staff in East Kilbride on how the UK works together to improve the lives of people around the world. It is very good to be with you here with you today, and particularly to be able to thank you all for the work you do on behalf of the government and on behalf of the British people. Vital work that helps millions around the world and speaks strongly to the values that we share as a country. And it is vital work. Not just because the things you do here have a material impact on the lives of some of the poorest and most vulnerable people around the world. But also because the work you do here, in conjunction with your colleagues at the Department for International Development in London, says something important about Britain. It says that we are a kind and generous country. It says that we are a big country that will never let down – or turn our back on – those in need. And it says that we are a country that does, and will always, meet our commitments to the world – and particularly to those who so desperately need our support. And that is important to remember. For we stand on the threshold of a significant moment for Britain as we begin the negotiations that will lead us towards a new partnership with Europe. And I want to make it absolutely clear as we move through this process that this is not, in any sense, the moment that Britain steps back from the world. Indeed, we are going to take this opportunity to forge a more global Britain. The closest friend and ally with Europe, but also a country that looks beyond Europe to build relationships with old friends and new allies alike. The work you do will be at the heart of that effort. Because from this building, work is co-ordinated that saves lives around the world; that builds a safer, healthier, more prosperous world for people in developing countries; and that makes our own country and people safer and better off too. It’s not all about charity of course. You know that better than anyone. So often, the work you do is about empowering people to live better, fuller lives. For example, your work is leading the world in efforts to end the outrage of violence against women and girls, a cause that is particularly close to my heart. You ensure that the UK is working well with important international institutions like the UN and the Commonwealth. And researchers here are exploring the potential for new vaccines to prevent the devastation caused by serious illnesses and epidemics. I know, for example, that the work to tackle the awful Zika virus that is a source of such anguish for people across Latin America is being led by researchers at Glasgow University, supported by teams here. But sometimes events happen that simply require an immediate and significant response. And it is because of the work you do that we have recently been able to announce significant support for the nations facing up to major humanitarian crises this year. Somalia, where we have pledged £110 million of UK aid to provide up to 1 million people with emergency food assistance, over 600,000 starving children and pregnant and breastfeeding women with nutritional help, over 1 million people with safe drinking water, and more than 1.1 million people with emergency health services. And, of course, our commitment to Somalia goes further than money. We look forward to bringing the international community together in London in May for the second London Somalia conference, where we hope to be able to help that nation secure and build on the progress it has made in recent years. It is because of the work you do that the UK was one of the first major donors to respond to the UN’s appeal for South Sudan. We are leading the way in that desperate nation by making sure millions of people get the food, water and medicines that they so urgently need. That includes food for over 500,000 people, life-saving nutritional support to more than 27,500 children, safe drinking water for over 300,000 people and emergency health services for over 100,000 more. And it is because of the work you do that the UK is able to lead the way in helping countries elsewhere in the region – in Uganda and Ethiopia. And in Kenya, where the Hunger Safety Net Programme aims to reduce poverty and hunger in the short-term, and to build economic resilience for the most vulnerable people in the poorest parts of the country. And that is the best way to give them a sustainable, long-term route out of poverty. Across Africa, vulnerable men, women and children are being helped by initiatives and projects that come with a simple badge of hope: a badge that says UK Aid. And the same goes for other parts of the world too. Wherever people are in need, that same badge of hope appears. In 2016, the UK was the third largest bilateral contributor to the humanitarian response in Syria, and the second largest overall since the start of the response in 2012. We have pledged more than £2.3 billion to support those affected by the conflict, our largest ever response to a single humanitarian crisis. That is a record of which we can all be proud. And because we are a country that does not duck our responsibilities, let us remember the amazing work being done in Afghanistan today. One of the legacies of years of conflict in that country is the deadly phenomenon of landmines that still lie strewn across hundreds of acres of that land. But thanks to UK Aid – and in particular, thanks to the work of organisations such as the Halo Trust that has its headquarters right here in Scotland – almost 100 square kilometres of contaminated land has been cleared. And around half a million people have benefitted as a result. We will continue with that work, and continue to support Afghanistan’s security, because that is in the interests of Afghanistan and in the interests of Britain too. UK Aid is a badge of hope for so many around the world – and I hope that everyone here feels proud to be able to play their part in bringing light where there is darkness, and hope where there is despair. But that badge – UK Aid – says something else. It appears on the side of buildings, school books, medical supplies and food parcels in some of the toughest environments and most hard-to-reach countries on the planet. And it says this: that when this great union of nations – England, Scotland, Wales and Northern Ireland – sets its mind on something and works together with determination, we are an unstoppable force. 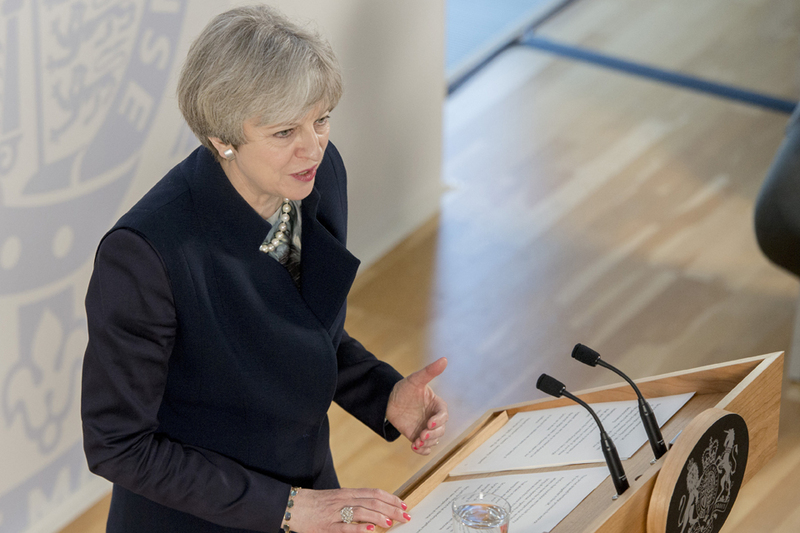 That is why the Plan for Britain I have set out – a plan to get the right deal for Britain abroad as well as a better deal for ordinary, working people at home – has as its heart 1 overarching goal: to build a more united nation. Because I believe when we work together, there is no limit to what we can do. A more united nation means working actively to bring people and communities together by promoting policies which support integration and social cohesion. In Scotland, Wales and Northern Ireland that means fully respecting, and indeed strengthening, the devolution settlements. But never allowing our Union to become looser and weaker, or our people to drift apart. So in those policy areas where the UK government holds responsibility, I am determined that we will put the interests of the Union – both the parts and the whole – at the heart of our decision-making. International development is a prime example of that, and your work here, on behalf of your fellow citizens across the United Kingdom, has a huge impact. Indeed, the work we do as a United Kingdom on the world stage makes an eloquent case for our Union as a whole. It is about the values we share in our family of nations. Values of freedom of speech, democracy, respect for human rights, the rule of law. This proud shared heritage provides the bedrock of our lives together in the UK. And on that foundation we have built a country where we share the challenges that we face, and bring all the expertise, ingenuity and goodwill we share across this Union to bear to tackle them. That allows us to do amazing things, like the life-saving work which is led from this building. So as Britain leaves the European Union, and we forge a new role for ourselves in the world, the strength and stability of our Union will become even more important. Not just for the good that standing together brings to our own people here at home. But also for the good we can do together in the world, as a global Britain. A force for good, helping to build a better future for everyone. So as we look to that future – and as we face this great national moment together – I hope you will continue to play your part in the great national effort we need to build the stronger Britain, the fairer Britain, the more outward-looking Britain and the more united Britain that I am determined we should be once we emerge from this period of national change. Because as you prove every day through the work you do – and as some of the most vulnerable people in some of the most desperate conditions around the world can attest – this United Kingdom, and the values at its heart, is one of the greatest forces for good in the world today. And when we work together and set our sights on a task, we really are an unstoppable force.